This is an incredible honor for A&A, and it’s quite the accomplishment for them to win this award in the highly competitive Japanese market. We sincerely thank all A&A employees for their hard work and dedication, resulting in this tremendous success. 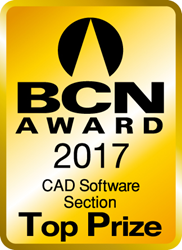 Global design and BIM software developer Vectorworks, Inc. congratulates its Japanese distributor A&A Co., Ltd for receiving a BCN AWARD 2017. Winning the CAD software category, A&A received the honor due to its 32 percent Japanese market share, making Vectorworks software the bestselling CAD solution in Japanese electronics retail stores. As the market leader, Vectorworks beat out software providers Phototron Limited (24.3 percent market share) and Lilac System Inc. (21.8 percent market share). Market share is based on statistics accumulated from 2,614 stores providing sales reports to BCN Co., Ltd., the organizer of the BCN AWARD. Now in its 18th year, the BCN AWARD collects the sales data of major domestic electric appliance mass merchandisers, personal computer specialty shops and net shops in Japan. Based off these numbers, the awards recognize manufacturers with the highest total annual sales volume. This year, 58 product provider companies received prizes in 121 different categories, with a range of software categories such as Business software, Communications software and Education/learning software. This marks the seventh year that A&A was recognized with a BCN AWARD, winning third place in 2012 and second place from 2013 to 2016. To learn more about the Vectorworks line of design software for the architecture, landscape and entertainment industries – which is available in twelve languages – visit vectorworks.net. Vectorworks, Inc. is a global design and BIM software developer serving over 650,000 professionals in the architecture, landscape and entertainment industries. Since 1985, we’ve been committed to helping designers capture inspiration, nurture innovation, communicate effectively and bring their visions to life. With our cross-platform software, designers can build data-rich, visual models without sacrificing the design process, while collaborating efficiently throughout the project life-cycle. Headquartered in Columbia, Maryland, Vectorworks is a part of the Nemetschek Group. Learn how we empower designers to create experiences that transform the world at vectorworks.net.